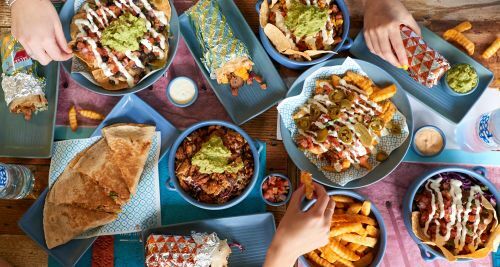 Menulog delivers for Salsa's Fresh Mex - Newstead so you'll be able to track your courier on a map. Choose 2 x Burritos. Served with 2 x Regular Mexicrinkles and Your Choice of 2 x Cans of Soft Drink. Your Choice of 2 x Burritos and 2 x Mini Burritos, Served with 2 x Regular Mexicrinkles. Your Choice of 2 x Burritos and 2 x Mini Burritos, Served with 1 x Large Mexicrinkles, 1 x Original Nachos and 1 x 1.25L of Soft Drink. Your Choice of 5 x Burritos, Served with a Box of Mexicrinkles and 1 x 1.25L of Soft Drink. Standalone - No drinks and chips! Regular Combo - With 375ml drink and Mexicrinkles. Large Combo - With 600ml drink and large Mexicrinkles. salsa, black beans, guacamole and chipotle salsa. Chipotle chicken, lettuce, shaved zucchini, salsa fresca and guacamole. Chipotle chicken, coriander and lime rice, onion and capsicum, salsa fresca and smokey chipotle mayo. Ground beef, coriander and lime rice, black beans, salsa fresca, lettuce, cheese and ranch dressing. Chipotle chicken, quinoa, lettuce, red cabbage, pickled veggies, corn salsa, onion and capsicum and chilli lime mayonnaise. Chipotle chicken, coriander and lime rice, corn salsa, onion and capsicum, zucchini and broccoli, black beans, ranch dressing and ranchero salsa. Grilled steak, coriander and lime rice, cheese, salsa fresca, lettuce, onion and capsicum and smokey chipotle mayonnaise. 14-hour beef, coriander and lime rice, salsa fresca, lettuce, red cabbage, ranch dressing and tomatillo salsa. Grilled steak, mexicrinkles, cheese, salsa fresca, chipotle salsa and ranch dressing. Pulled pork, coriander and lime rice, salsa fresca, red cabbage, black beans, sour cream and chipotle salsa. Chipotle chicken, coriander and lime rice, onion and capsicum, salsa fresca and smokey chipotle mayo..
beans, sour cream and chipotle salsa. Corn chips, cheese, salsa fresca, sour cream and ranchero salsa. Corn chips, 14-hour beef, cheese, salsa fresca, black beans, sour cream and chipotle salsa. Corn chips, cheese, salsa fresca, black beans, sour cream, guacamole and tomatillo salsa. Melted cheese in a tortilla. Black beans, cheese, onion and capsicum, salsa fresca and smokey chipotle mayonnaise. Chipotle chicken, cheese, onion and capsicum, salsa fresca and smokey chipotle mayonnaise. Pulled pork, cheese, black beans, salsa fresca, ranch dressing and chipotle salsa. Shaved zucchini, pickled veggies, red cabbage, lettuce, broccoli and zucchini, corn salsa, onions and capsicum, salsa fresca, guacamole and ranchero salsa. Chipotle chicken, coriander and lime rice, quinoa, red cabbage, salsa fresca, corn salsa, guacamole and ranchero salsa. Chipotle chicken, red cabbage, lettuce, quinoa, shaved zucchini, onions and capsicum, pickled veggies, salsa fresca, broccoli and zucchini and chipotle salsa. Seasoned crinkle cut potato chips. Ground beef, mexicrinkles, cheese, salsa fresca, jalapeños and ranch sauce. Spanish donuts covered in cinnamon sugar with chocolate dipping sauce.